From the late 1830s the British-based New Zealand Company actively recruited settlers to colonise New Zealand. Their first settlement was at Port Nicholson (later Wellington) in January 1840. 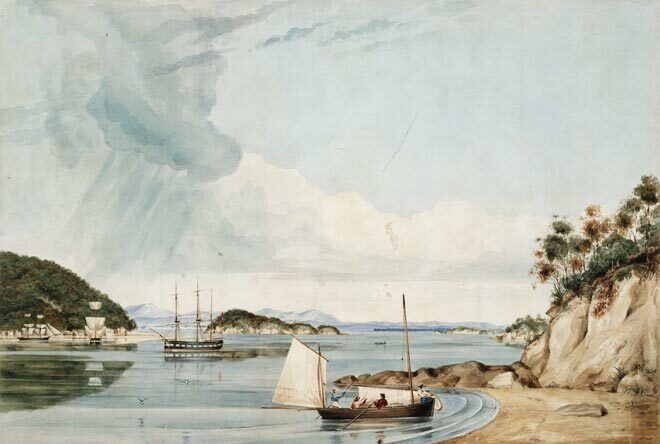 This painting shows the company's vessels exploring the harbour at Tasman's Gulf (later Nelson) in 1841, in preparation for a second settlement. These ambitious and sometimes unscrupulous commercial activities put pressure on the British government and colonial officials to sign a treaty with the native owners of New Zealand – the Māori.